Summer flew by and we're already finishing up the 3rd week of our new "school" year. I started early because I love finishing up in the early part of May when the weather is starting to feel nice again. Oh, and we're off on another adventure next week and won't be back until September! This morning I'm trying to decide which knitting project will become my next work in progress. It looks like the Gathered Pullover from IK Winter 2007 may be the one. 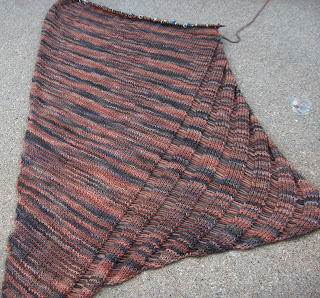 Or maybe a Noro top down raglan cardigan. This may be way too hot to work on during my week stay in Southern California. I started another Clapotis on Saturday thinking I could probably finish it up in time to wear it on my traveling adventure. I'm not so sure I can find enough knitting time to finish it up in the next week. I forgot how long it took me to finish up the last one. I acquired the yarn from Brooks Farm at the Midwest Fiber and Folk Fair. This fest was a fabulous way to spend a Saturday. 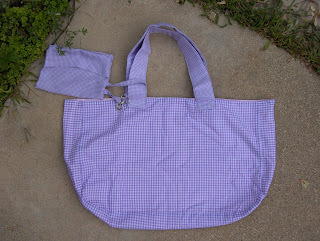 I finished sewing up a portable shopping bag and think these would make great gifts. I had been searching through Petfinder.org at the end of July when I found Baxter. He was was rescued from a kill shelter in Southern Illinois that was going to euthanize the whole litter. He was 12 weeks old when we adopted him on July 28th. 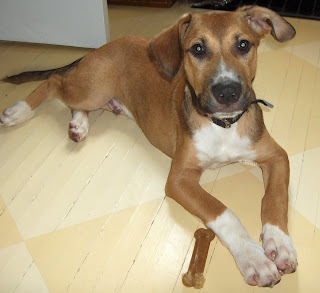 He's a Boxer/Shepherd mix so he'll probably be a pretty large dog when he's an adult. It's been kind of like adding to your human family. The first couple of days with pup was kind of like "What the hell was I thinking!" A puppy is so much work with the no manners/no house breaking/chewing everything in sight. Then he settled into our family and he's such a good pup. We haven't had a "mess" in the house for 2 weeks and he fits right into our routine. It feels so good to have a furry head in the house again.